My son is 9 years old and well beyond the age of needing a stroller but ever since we found out we were having our first baby I have really loved to follow the design efforts of strollers and other products designed around a child or parent's needs. 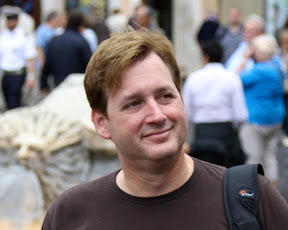 Matter of fact, my first blog post even discussed strollers. I guess they are a mode of transportation (I love bikes, cars and planes)...offer tons of options ranging from overall design choices, use of materials and a whole host of configurations and accessories. Lots of customizing and personalization can go into buying a stroller. There are strollers for the earliest of a child's years, multiple children setups, solutions for active parents with jogging strollers...the list goes on. And if you read my first piece, you know I drove my wife crazy with the endless comparing of different manufacturer's products. It took weeks to settle on our first stroller. UPPAbaby is one of the brands I seem to favor. I like their products from a design, functionality and everyday usability standpoint. 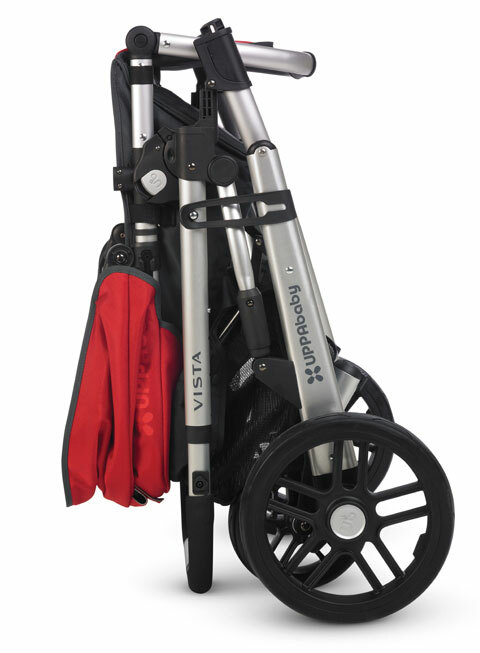 A great example of the UPPAbaby strollers is their Vista 2012. It is a great universal stroller system suitable for newborns to 6 months in the easily separable bassinet made with an organic cotton + soybean fiber lining...all the way into a seating configuration that supports children up to 50 lbs. The seating positions are fully adjustable with one hand and include a fifth fully reclined position for your little one when they are sleeping. You can setup the seat for either a front or rear facing configuration. With accessories the stroller can accomodate up to three small children! 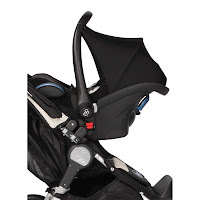 The VISTA is compatible with Graco (SnugRide, SafeSeat, SnugRide 30, SnugRide 32 and SnugRide 35), Peg Perego (Primo Viaggio and Primo Viaggio SIP), Chicco (Keyfit and Keyfit 30), and Maxi-Cosi (Mico, Maxi-Cosi Citi, Maxi-Cosi Cabrio and Maxi-Cosi CabrioFix) infant car seats via available adapter accessories. The canopy height is fully adjustable, as is the 3 position handle length adjustments and you have tons of storage for all your babies needs. Maneuvering this incredibly versatile stroller is like a dream with some of the widest rubber all-terrain tires available that makes pushing this stroller a pleasant experience. The only thing I want to point out is that this is a moderately heavy stroller. We are talking about a serious piece of equipment made out of aircraft aluminum that will take both hands to fold-up and get packed in or out the car. The UPPAbaby Vista Stroller retails for $680 but I've seen it online in the mid to upper $400s with both bassinet and seating configuration included and this conversion between modes does not require any fabric switch-out. Standard accessories also include a sun, weather and new SPF 50 canopy extensions. As I said, this product is fully loaded. The Britax B-Ready is another stroller with a monstrous amount of configuration options. While it retails for $500 (but it is regularly available online in the low $300s) which is a far bit less than the Vista mentioned above but you can upgrade the B-Ready with a lot of high quality accessories depending on your personal needs. In the standard setup, you have seating for children 6 months up to 55 lbs. By adding an infant car seat or bassinet option, you are good from the moment you bring the baby home from the hospital. 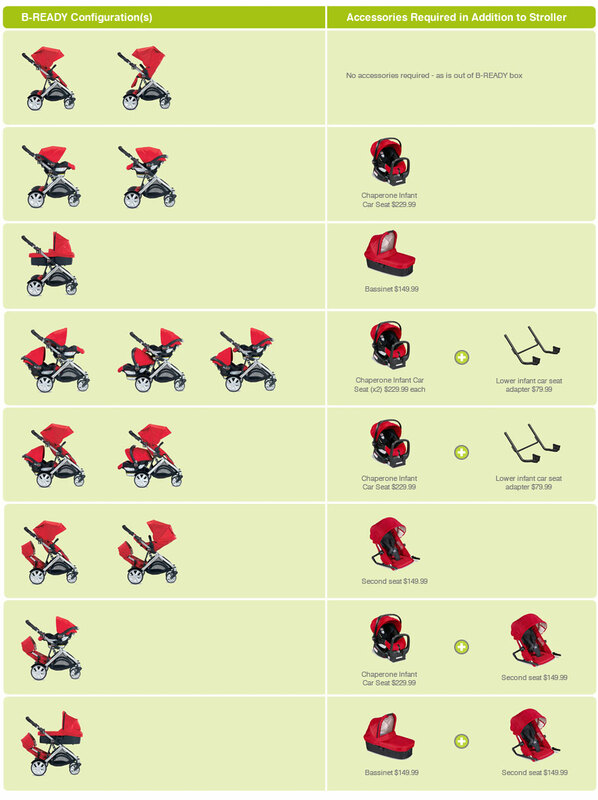 As you can see from the chart to the right, B-Ready stroller's configuration options are quite impressive. Not only can you immediately leverage the Britax Be-Safe infant car seat (not shown on chart but available online for $140) and the higher-end Britax Chaperone infant car seat (typically available for around $200) with the included adapter but with the addition of the Infant Car Seat Adapter Frame accessory ($45), you can integrate a wide range of manufacturer's infant car seats. We are talking about seats like the the extremely popular Chicco Key Fit 30, Graco Snugride 32 and the Peg Perego Primo Viaggio attachment systems. The top seat is reversible allowing for forward or rear facing and is adjustable to three levels of recline. You can also elevate the calf rest to make the baby more comfortable when asleep. I do wish that the seat reclined all the way flat like the Vista but overall this stroller will make sure your child rests comfortably. As you probably noted from the configuration chart, the B-Ready is convertible into a double stroller were you needing to transport two infant car seats or a bassinet and second seat for the older child. The large canopy includes a sun visor, ventilation window and rain cover that is located in the under-seat storage. Speaking of storage, this stroller has it in spades! Definitely feels like you should be able to bring everything you need and it is easy to access. From a usability standpoint, the stroller is easy to maneuver, has a nice ride and the adjustable handle height comfortably accommodates the tallest of parents. Folding is straight forward and easy even with some accessories attached. Unlike the first two strollers, the next stroller requires you to choose a single or double configuration out the door. That said, the Baby Jogger City Mini Single is a popular, award-winning design and worth a look at. This is a very lightweight stroller, something you will appreciate the more to travel and have to transition from vehicle to stroller and back. It is bigger than the umbrella strollers but a good bit smaller than the traditional ones. 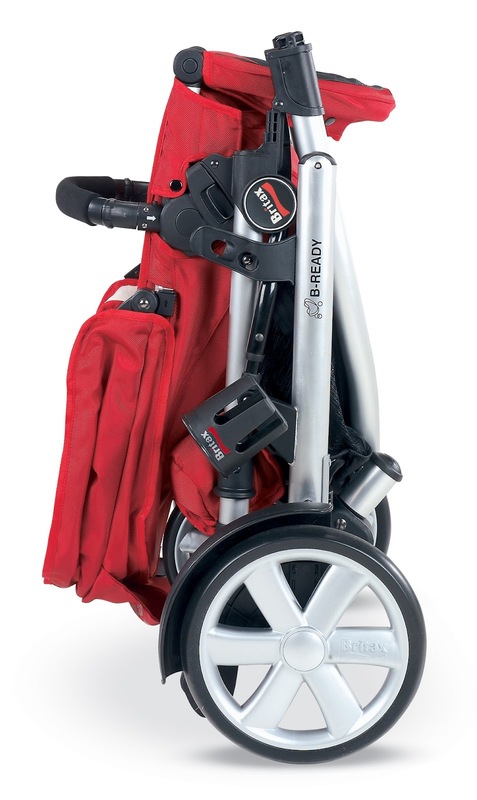 Due to its overall size and clever design, this is one of the easiest strollers to fold I've seen. A single fluid motion packs up this stroller and you are good to go! I would have to say that this stroller steers well enough and has a pretty good ride. While the City Mini looks like an all-terrain (jogger) model...it really is designed for the city and works best on paved surfaces. Seating in older versions of the City Mini did not have much structure behind them for back support...more like a sling. But the 2011/2012 versions address this with a better padded seating backboard. The seat is also adjustable to roughly a 150 degree reclined position. The sun canopy provides best in class protection while also offering great ventilation and windows. Handlebar height is not adjustable like the first two strollers but is curved and tall enough for most parents. Like other products here, the Baby Jogger offers an excellent array of accessory options. You can get a full Baby Jogger Bassinet (retails for $250) for your newborn. Or the Baby Jogger Car Seat Adaptor allows you add a wide assortment of car seats to easily move your infant from car to stroller with ease. 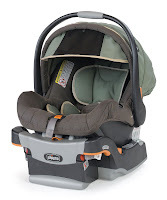 Infant car seats by Peg Perego Primo Viaggio, Britax, Maxi Cosi, most Graco and Evenflo. If you want to install the popular Chicco Key Fit 30 car seat to your City Mini, there is a different Baby Jogger "Chicco" Car Seat Adaptor. One caveat, you will see some lukewarm reviews regarding these adaptors, the truth is that installation is a bit of a trick (check online for better details than instruction manual)...but once installed properly everything is great. Note that the rain and wind canopy is sold separate as well. Boy these accessories can really add up! I am always partial to small, lightweight and easy to use products and the Baby Jogger City Mini fits that bill perfectly. 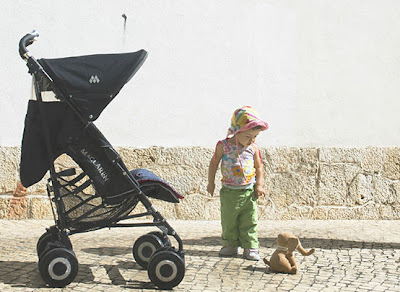 If you want the most expensive for your little one, obviously the Bugaboo Cameleon ($900) is probably on your radar. But I just don't buy the hype. It does offer a wide range of accessories and configurations, has a hefty suspension system but it just isn't the most convenient to travel nor fold in day to day use. Don't get me wrong, it is a quality piece of hardware and definitely the Rolls Royce of the group. Just not my first pick. If your fixated on a heavy-duty suspension for your stroller, check out the BOB Revolution SE Stroller (available online for roughly $360). With its large tires and suspension you have really take this one for a run. 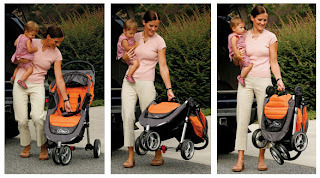 Before wrapping up this review, I can't go without talking about the Maclaren line of strollers. I've mentioned several times that lightweight, portable and easy to fold should be key contributors to your purchase decision. My own first stroller purchase while feature rich really suffered in the "mom getting kid in-n-out of the car" test. Our second stroller was the Maclaren and we went around the world several times with it. The latest model, the Maclaren Techno XT stroller ($320) is an umbrella collapsable type of stroller that can go anywhere you go. 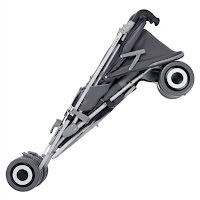 It is not necessarily an "all-terrain" like many of the others mentioned above but when you are on the go in the city, in a parking lot trying to put it in your car and navigating the mall...this is the stroller for you. Now the Maclaren is designed to support newborns until 55 lbs but does not support car seat adaptors, so I wouldn't recommend this as your first and only stroller. The convenience of moving a sleeping infant car seat from vehicle to stroller is hugely invaluable. But your newborn does have ample support in this stroller from day one should you choose...I'd just recommend 3 months and up. 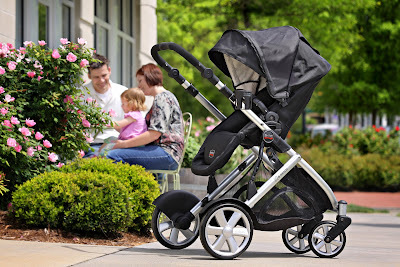 Keep in mind that all the strollers we've discuss here feature the latest safety and creature comforts for your little one including 5-point harness seatbelt, padded seating, sun/wind/rain protection...the list goes on. They are all quality products that are well constructed and thoughtfully designed. There are more stroller manufacturers and models to look at but I focused on the higher-end offerings for this comparison. The UPPAbaby Vista is a complete system out of the box and covers your baby from birth to 50 lbs. Considering everything you get, the online prices seem to really be a great value. At the end of the day this is a very good, universal stroller that covers a wide range of terrain and everyday use cases. The Britax B-Ready is a solid contender here and properly accessorized is quite comparable. The Baby Jogger City Mini is a wonderful lightweight, multi-configuration stroller. It is great for city dwellers or people looking to transport a stroller in and out of their vehicle often. This product is one of the easiest to fold and get going I have seen. 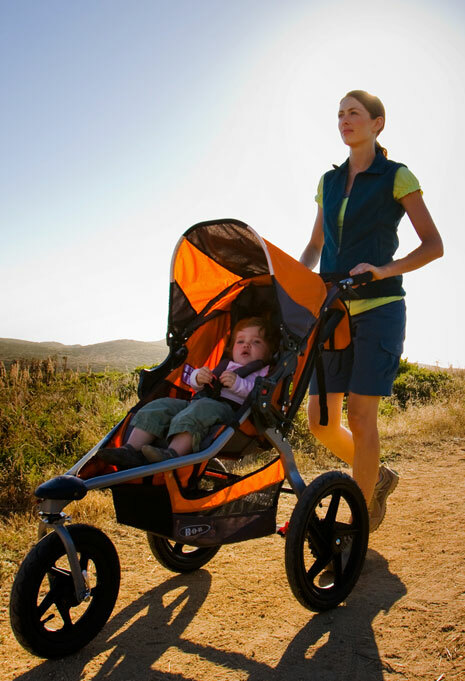 If you are looking for a truly small and lightweight umbrella type stroller, the Maclaren Techno XT is best in class. Not only does this stroller go where you and baby go but it does so in style. Great looks, quality construction and great comfort really makes this product a standout. I've mentioned the Chicco Key Fit 30 (retails for $190 but online for mid-$100's) a couple times...I really like this infant car seat. Definitely one of the best car seat and base systems on the market today. The Chicco KeyFit 30 System features a spring-assisted level foot, bubble level guides and center-pull LATCH adjustment to make sure everything is safe and secure during installation. The seats interior is lined with EPS foam for impact energy absorption. Also included is an infant insert for babies 4 to 11 lbs and without the insert this large seat accommodates babies to 30 lbs. 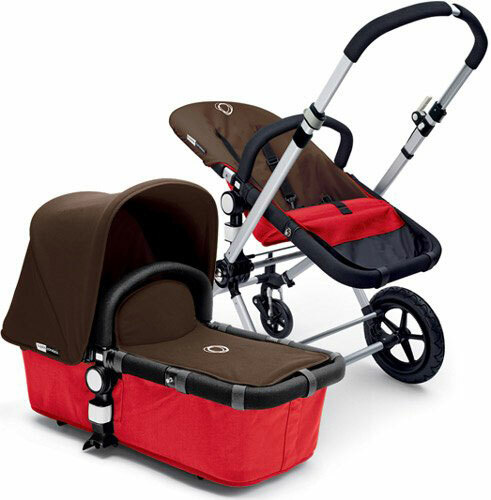 The seat is quite popular due to its quality and safety standards which means all the manufacturers mentioned above offer adapters to this seat onto their strollers. I hope this write-up helps you narrow down your new stroller shopping efforts. Comment below if you have any thoughts or suggestions on strollers and other children care products. It is really awesome because of good latest features like flexible seat,high security for baby and many more,for more info cheap lightweight stroller. and many more features available.